I’m a big fan of Marvel and DC superhero movies, and I’m really happy that some of the slightly lesser known stories are getting their own films and TV series. 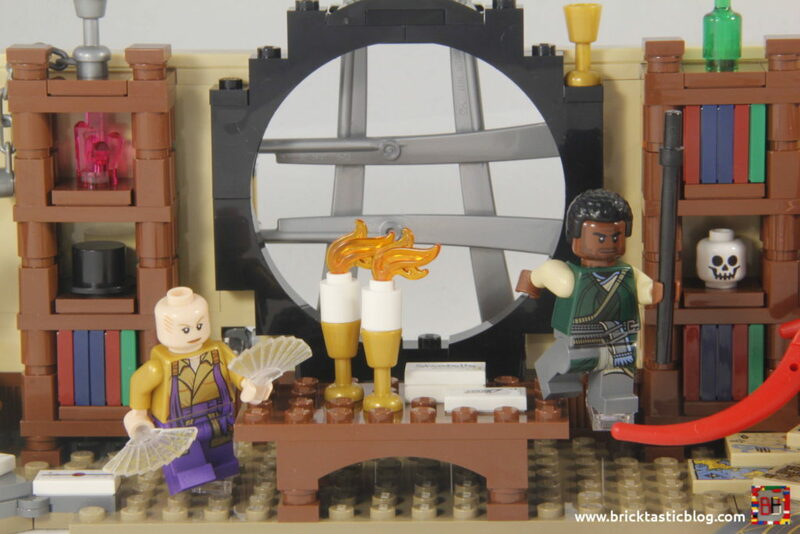 Dr Strange is one of those stories, and not only does it get a film, but it gets a LEGO set as well! There are some interesting concepts in this film that haven’t really been seen in the other Marvel movies, and that’s of magic. This is where that all changes though. Inside the box will be three numbered parts bags, two instruction booklets, a sticker sheet with eight stickers, and a loose 8×16 tan plate. IMPORTANT! Please note that there may be spoilers ahead if you haven’t seen the movie. 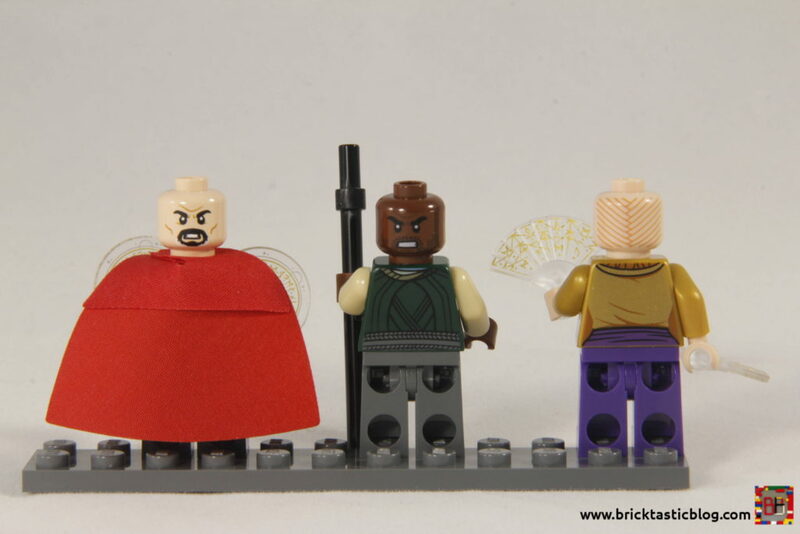 Let’s first look at our three minifigures. 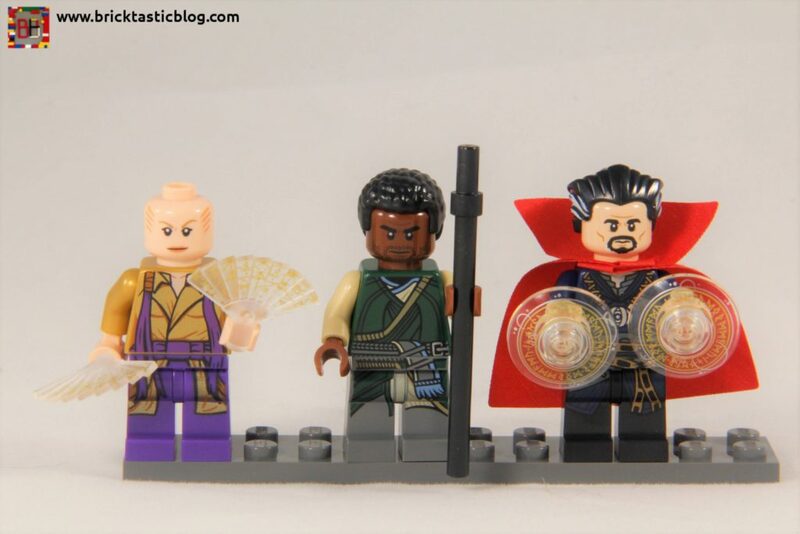 There’s Dr Stephen Strange, Karl Mordo, and The Ancient One. All have been designed from their movie counterparts, and all have beautiful printing. Dr Strange, our hero – played by Benedict Cumberbatch, is rather grandiose. He’s got a large red Cape of Levitation (unfortunately it’s still the old, stiffer fabric, not the new soft fabric seen in the LEGO Batman Movie sets), and a dark blue garb, printed front and back. He’s got the Eye of Agamotto (the source of his power) around his neck, as well as some leg printing. His head is double sided, with an angry expression and a look of concentration. I like that the printing detail goes as far as the bits of white in his goatee. His hair has been seen before, especially with a few vampires, but this time with a few white highlights. Dr Strange also has a few spells that have been cast, and printed on two 2×2 clear dishes, with the new grip studs as well. The printing on these are very intricate, and quite beautiful. POSSIBLE SPOILER ALERT: In the movie he hasn’t gone full bad guy yet, and needs to hang out with Strange so there’s a balance between good and evil. Anyway, Mordo has a dark green tunic on, again, with leg printing, and has a double sided head – concentrationface on one side, and angry on the other. He’s also got a black quarterstaff (the Staff of the Living Tribunal) as a weapon. It’s a dull weapon, element-wise. Lastly, there’s The Ancient One (Tilda Swinton), dressed in a rather loud yellow and purple outfit. There’s a bit of shiny gold included in the printing, as well as a double sided head, but with hair on the back instead of another face. She carries two beautiful printed clear fans. I love these, and they’re a new mould! I’m looking forward to seeing if fans come in other sets. I’m thinking maybe LEGO Ninjago. It’s a shame the costume isn’t proper to the movie (the yellow aspects are, but not the rest). The rest of the elements are just as good. 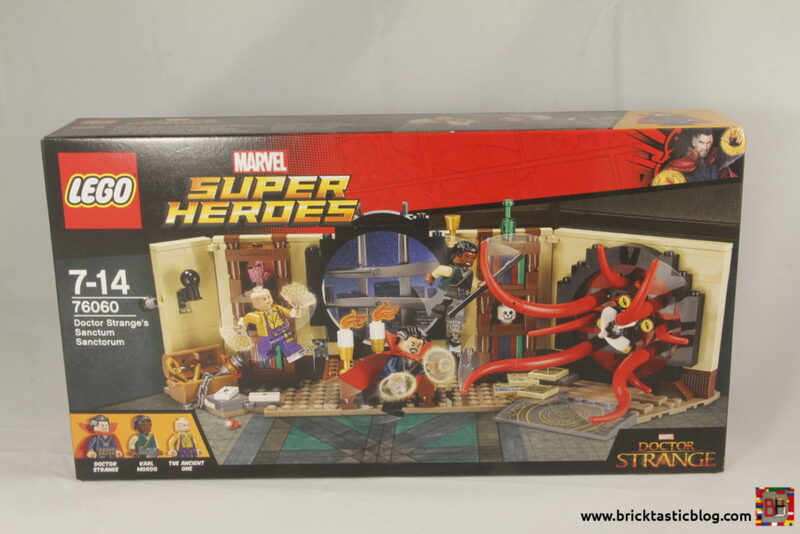 Obviously all the minifigure elements are new prints, as well as the fans and Strange’s radar dishes, but this set also has some other excellent inclusions. I love the eyes of the monster – they’ve only been seen in one other set – 76081: The Milano vs. The Abilisk, but they’re just so versatile! I also like the tentacles of the monster. I’ve not got many of these at all, so having so many in red, and the middle parts especially, is a big boost. Other inclusions that are not usually considered standard are the grip studs, more chain, maps, the top and bottom arches and the keys, just to name a few. This set includes a number of play features, most of which are obvious, but one is not (well, it wasn’t to me). The big play feature is of course the portal beast. There’s not much that the monster really does apart from turn the outside tentacles, which end up hitting each other in the middle anyway, but it’s still a nice novelty. What’s good about it is that it can easily grab on to a minifigure to seal their doom. The second play feature is the levitation trick. 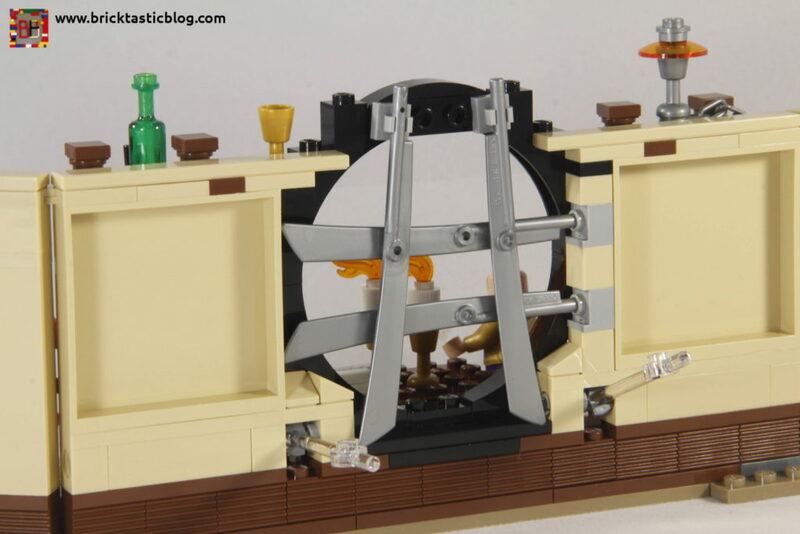 Protruding through the back wall and under the other minifigures are two transparent rods with plates. These are used to make the minifigures fly! It’s a neat trick, but I can’t imagine it making much of an impact for an extended period of time. The final play aspect of note is the Cape of Levitation. Above the chest is a black rod with a ball over the top. Unknown to me, the idea is that the cape is taken off Dr Strange, and inserted under the ball. Apparently, from the back, the black ball looks like the back of Dr Strange’s head. Push the ball on the other side of the wall down, and the cape “levitates”. It’s clever, but it would have been better had there been an extra cape included. It all starts with the construction of the portal beast. 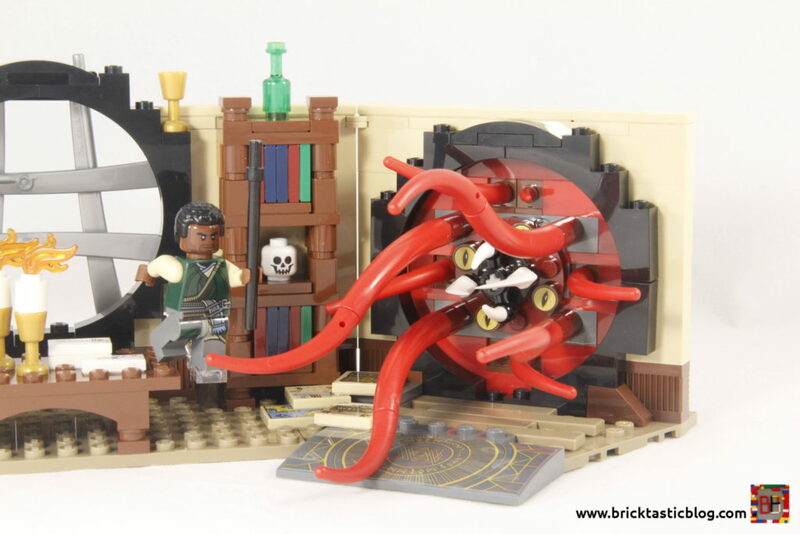 It’s surprisingly simple, with the outside frame of the “portal”, followed by the monster, created layer by layer using 1×6 Technic bricks with axles and cogs. It’s not the way I thought it would be constructed, so I was pleasantly surprised! Obviously, next comes the rest of the model. The window frame is put together after the bottom of the wall is put together. The wall goes up relatively quickly due to two large 1x6x5 wall panels, with the framework of the window being finished. The detailing, using large blade elements is added, with a very intricate detail that I’ve never seen before in LEGO instructions. The 1×1 plates with clips need to be added slightly off kilter, in order to have the blades at the correct angle. It’s subtle, but important. The bookcases are next. They’re nice, but there is one detal I’m not happy about, but I’ll get into that in the next step. They’re simple to build, and have a little SNOT work thrown in for good measure, although it’s very minimal. Lastly, there’s the table. It’s simple, nothing else to it. I was surprised with the Cape of Levitation play element. There is a stick with holder there, but it’s added in, with the bricks added around it. When the wall is complete, the rod is pushed through from the side instead of using it like a clip. It’s hard to explain, but it’s not the standard way of using a clip element, that’s for sure. Overall, the build process is surprisingly simple. There’s no real crazy build techniques. It’s great for LEGO fans of all ages, and good fun to boot. There are a few stickers to apply, the most annoying one is the large sticker on the ramp, but the detailing is so nice, it’s actually ok. The smaller stickers are also just as nice, with the 2×2 stickers reading “The Codex Imperium” and “Book of the Invisible Sun”, but the 1×2 stickers are brilliant, with one of them having the Stark Industries logo (intriguing), and the other with “Shamballa”, which is a brilliant nod to the film. If you haven’t seen it yet, don’t worry, I won’t spoil it. If you’re curious though, check out the second trailer. The big question here is whether the set is similar to the movie, and even the graphic novels. The only real link to the film, and it’s a tenuous one at that, is the window feature. Yes, the shape is there, but it’s not set at an angle (like in a roof) as it is in the other media formats. The detailing (with the swords) is also not right. It’s a nice attempt, but it’s a bit of a miss. The other issue I have with the detailing of the set is the bookshelves, and more specifically, the books in them. They’re all the same! It’s really not that hard to mix up the colour order. The bookshelves themselves are stunning – the brown elements giving the illusion of carved wooden shelves, and I love the candlesticks on the table.Inside the treasure chest is a key and a jewel (presumably a ruby), with more letters on the floor. It’s a shame the 2×2 jumper tile is grey. I would have like to see this in white. Aside from that though, this set looks excellent. Sorry, I didn’t realise I forgot to take a photo of the full set in all it’s glory! For $60, this set is possibly a little pricey for some. 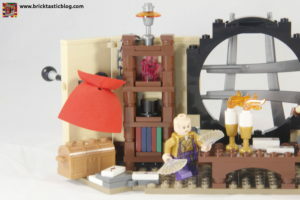 There are some useful elements included, and unique minifigures, but it is still rather small, footprint wise. There are certainly some better sets that you could get for $60, but unless you’re a fan, you may skip. On retirement, I predict this set will go up in price, but it’s hard to tell for now. Nevertheless, I’m pretty happy I purchased it. There’s no doubt in anyone’s mind that this set is one of a kind. It’s obvious on many levels. Whether this is enough to get you to purchase it is another matter. I reckon it’s pretty collectible though, and certainly for some of the elements. 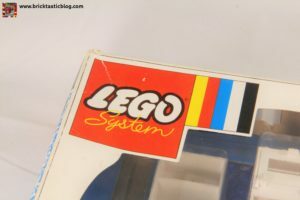 Next week, I’ll be looking at a few very special vintage sets. I’m not going to spoil the fun now, but they’re very old, and not very common at all! Stay tuned for that! Do you have a copy of 76060? Did my thoughts match yours? Let me know in the comments below!